Surgical shoulder procedures are known to be very severe and invasive for patients. During surgery, general anesthesia is administered to patients for analgesia, but post-operative pain can be just as problematic. Many physicians choose to perform nerve blocks before or after surgery to assist the patient with pain relief during the procedure and their rehabilitation period. An interscalene block is a procedure in which a patient receives a local anesthetic injection into the area of the brachial plexus (network of nerves which are located from the spine into the neck and arm area) that temporarily disables feeling in and movement of the shoulder and upper arm. An interscalene nerve block is usually administered to provide analgesia during or immediately after a shoulder, elbow, or upper arm surgery. How is an Interscalene Block Performed? During an interscalene block, the patient can remain awake and lucid or can be sedated by a general anesthetic. The physician reviews the patient’s medical history to determine if a sedative is needed or not and an anesthesiologist is on hand before the surgery if needed. A small sedative before or after the interscalene block is frequently recommended to aid the patient in maintaining a healthy blood pressure and heart rate. A sedative also assists in safeguarding the patient against body restlessness and excessive bleeding during the actual surgery. In preparation for the interscalene block, the neck area is thoroughly cleaned with an antiseptic solution and closely examined by the physician to determine the precise block injection point. The patient is seated or lying down, with the back slightly elevated and the head turned away from the area of injection. Fluoroscope guidance is often used by the physician during this procedure to ensure correct positioning and to clearly mark the entry point of the needle on the patient’s body. A needle containing a local anesthetic is then inserted into the patient’s neck, which numbs the entire arm and shoulder area. Patients tend to feel numbness and a tingling feeling during this process. Once the surgery has been completed, the patient will still feel the effects of the interscalene block and will not immediately be able to move their upper extremity. On average, the effects of the interscalene block will last less than 24 hours. Interscalene blocks are relatively safe and commonly administered before or after upper extremity surgery. Side effects following the injection may occur. Infection, skin discoloration, hematoma, voice hoarseness, tenderness of the injection area, allergic reaction, anesthetic toxicity, short-term paresthesia (very rare), and pneumothorax (extremely rare) have been reported. The patient will be given instructions on the amount of activity allowed after the procedure based on what type of surgery they have undergone. An interscalene block is regularly recommended by physicians to patients who are scheduled to undergo any type of painful arm, elbow, or shoulder surgery. The local anesthetic administered into the area of the brachial plexus immobilizes the upper extremity that is being operated on, allowing the patient to experience a more comfortable surgical procedure. Interscalene blocks are also beneficial after upper extremity surgery, when patients can experience extreme pain during the rehabilitation process. For patients faced with an upper extremity surgery, a physician frequently schedules an interscalene block procedure to assist with analgesia and inflammation before or after the surgery. The interscalene block is usually accompanied by a mild sedative to maintain healthy blood pressure and heart rate levels. A sedative can also aid the patient in being more relaxed and comfortable during the interscalene block treatment and surgery. Most patients who undergo an interscalene block will still feel the effects of the injection for up to 24 hours after the upper extremity surgery has been completed. If pain persists after surgery, the physician may recommend further injections to assist with analgesia during rehabilitation. Auroy Y, Benhamou D, Bargues L, Ecoffey C, Falissard B, Mercier FJ. Major complications of regional anesthesia in France: The SOS Regional Anesthesia Hotline Service. Anesthesiology. 2002;97(5):1274-80. Borgeat A, Ekatodramis G, Kalberer F, Benz C. Acute and nonacute complications associated with interscalene block and shoulder surgery: a prospective study. Anesthesiology. 2001;95:875-80. Hortense A, Perez MV, Amaral JL, Oshiro AC, Rossetti HB. Interscalene brachial plexus block. Effects on pulmonary function. Rev Bras Anesthesiology. 2010;60:130-7. Liu SS, Gordon MA, Shaw PM, Wilfred S, Shetty T, Yadeau JT. A prospective clinical registry of ultrasound-guided regional anesthesia for ambulatory shoulder surgery. Anesth Analg. 2010;111(3):617-23. Muhly WT, Orebaugh SL. 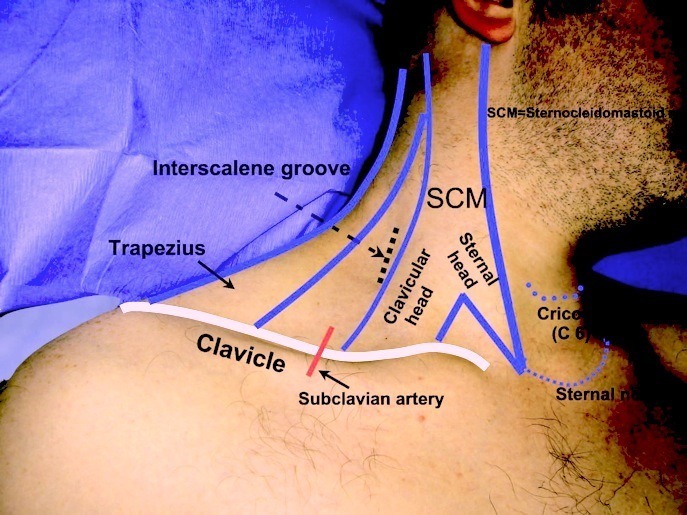 Sonoanatomy of the vasculature at the supraclavicular and interscalene regions relevant for brachial plexus block. Acta Anaesthesiol Scand. 2011;55(10):1247-53. Stone MB, Wang R, Price DD. Ultra­ sound-guided supraclavicular brachial plexus nerve block vs procedural seda­tion for the treatment of upper ex­tremity emergencies. Am J Emerg Med. 2008;26(6):706-10. Swenson JD, Bay N, Loose E, Bankhead B, Davis J, Beals TC, Bryan NA, Burks RT, Greis PE. Outpatient management of continuous peripheral nerve catheters placed using ultrasound guidance: an experience in 620 patients. Anesth Analg. 2006;103:1436–1443. Winnie A: Plexus Anesthesia; Vol 1: Perivascular techniques of brachial plexus blocks. Philadelphia, WB Saunders Co, 1984.